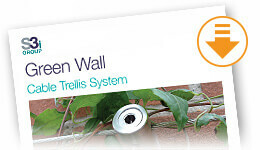 Small scale domestic green walls require very little in the way of maintenance. Issues such as climbing plants entering guttering or tendrils twining around window fixtures may need occasional sorting, but usually these are minor things that can be sorted out easily. Bigger installations or those with very sophisticated planting combinations may need a certain amount of maintenance. By choosing the right kind of training system a lot of the maintenance issues are eliminated but it is important to make sure that extensive areas of foliage are not allowed to become too tangled as this could compromise the support system and also the health of the plants. Where there is the possibility of shoots penetrating between materials in the building, for example under tiles, cladding or roofs, this growth will need to be cut back to ensure that the façade does not interfere with the fabric of the building. With careful planning and considered design of the support system most green facades need very little maintenance.